All Things Crafty: Ready.. Set... Go... I Think.. 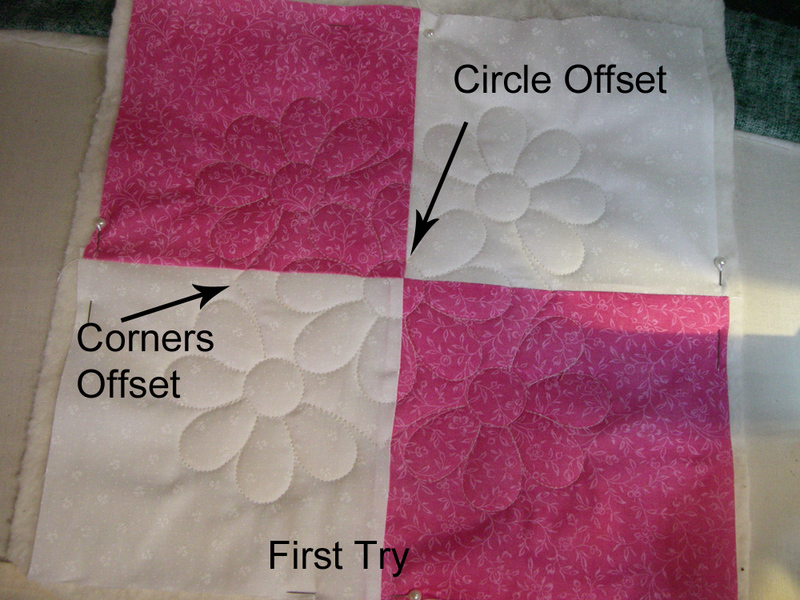 I had to resize the"Kitty and Daisies Block 13" design from One Song Needle Arts to 7.8 inches and then create two versions for the half blocks on my quilt. A top one and a bottom half. I had a little bit more room on my practice backing to stitch out the tests. 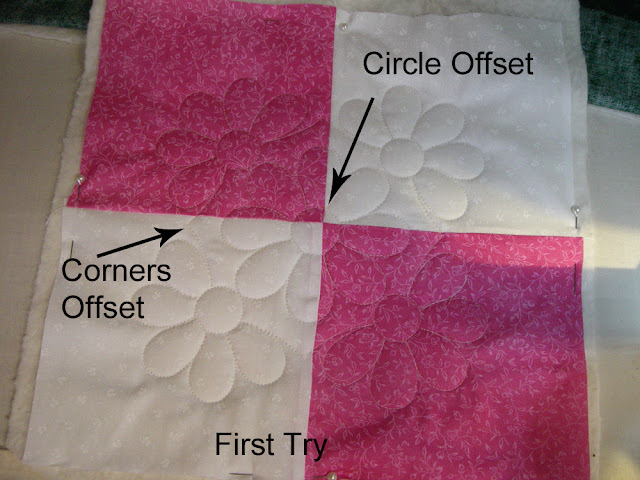 I tried out a little free hand quilting too... 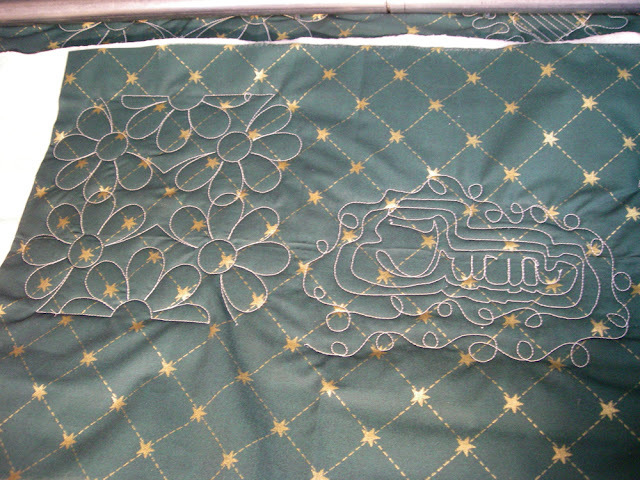 I remembered to unlock the prostitcher wheels this time on the freehand stitching and the movement was so much better. I was even able to stitch out my name and have it be recognizable. I then created two blocks in the pink/white combo to test out the daisy quilting placement. The first try was not a huge success. I was off by a few mm in my start point which threw off the side points and center circle. 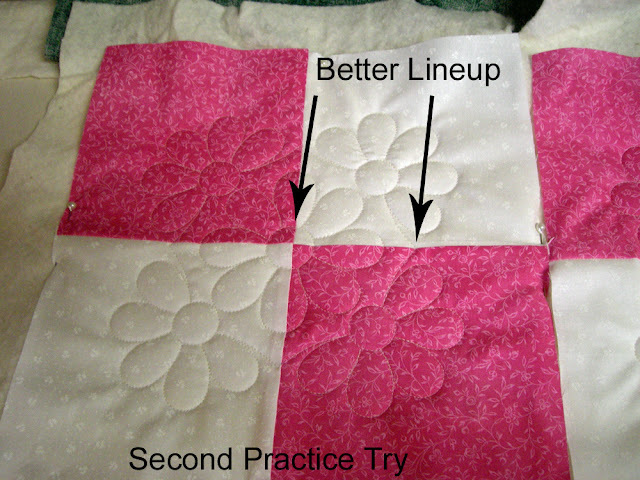 I'm sure this will happen again once on the quilt. It's not too too bad. I took the photos without flash so it would be easier to see the quilting. I'm surprised the white shows up better than the pink blocks. The second practice went better. At least the center and sides line up better. Looking at both blocks with the first try on the right and the second on the left. Now, It's time to load the quilt backing and get moving. I know I'll drag my feet because I'm a little nervous about ruining the quilt top. 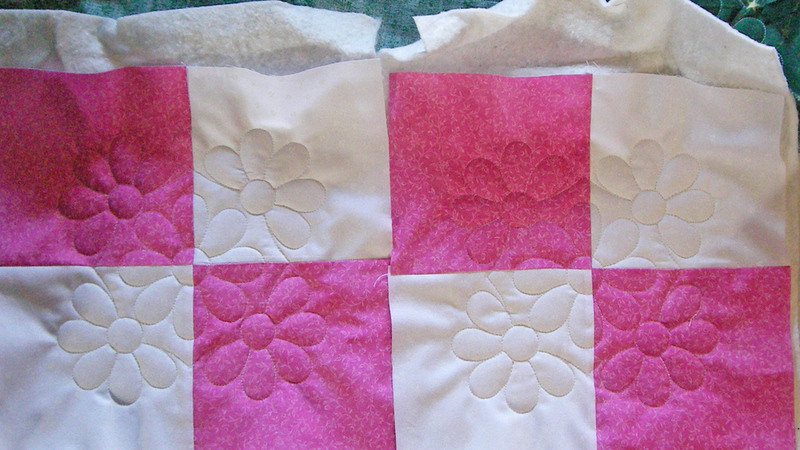 I hate having to remove quilting. They are such tiny, tiny stitches. Tomorrow, hopefully I'll load the backing. SWEET! I THINK THIS REALLY GOOD! I WANT TO TRY THIS FLOWER PATTERN.